Supplement Date: Nov 2018 i Previous editions(s) can be found in the Related Items tab. With over a billion dollars in patent deals under his belt, Mark Holmes is the founder and CEO of PatentBridge LLC, a privately held technology development firm in Silicon Valley that specializes in bringing to market select patented technologies covering extraordinary software and Internet-related breakthroughs. PatentBridge has sold a single patent for more than $4,000,000. Mr. Holmes is also the CEO and Co-Founder of RavenWhite Security, Inc. which was selected at the RSA Conference as one of the top 10 security startups worldwide. He was the co-founder of a successful telecommunications startup which was sold in the late 1990s to a portfolio company of the Alabama state retirement fund (Retirement Systems of Alabama). Mr. Holmes has advised such technology savvy entities as Visa, Sony, Applied Materials, University of California at Berkeley as well as many startups and was named to the IAM Strategy 300 – The World’s Leading IP Strategists. He served as co-chair of the Silicon Valley Chapter of the Licensing Executives Society (LES) from 2006 to 2011. He is a registered patent attorney, holds an engineering degree from Brown, is a member of the Institute of Electrical and Electronics Engineers (IEEE), and wrote the book PATENT LICENSING: STRATEGY, NEGOTIATION & FORMS. 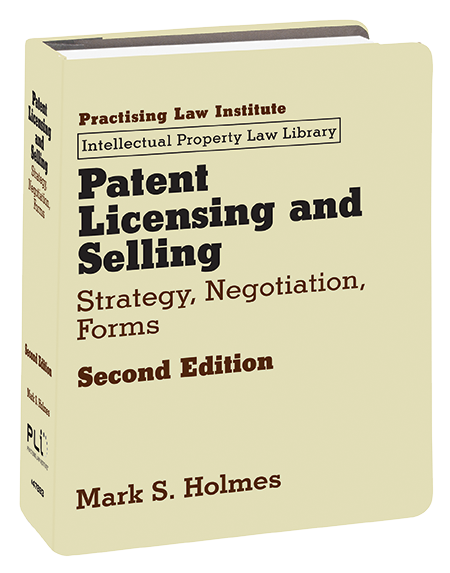 He co-chairs the Advanced Patent Licensing program of the Practising Law Institute (PLI) and speaks on software and technology licensing in the PLI Advanced Licensing program in New York, Chicago and San Francisco, Patent Licensing Today 2014: Marketing Money Without Getting Sued, Intellectual Property Law Institute, and Patent Law Institute. He lectures nationally on the pressing issues facing patent owners in the commercialization of their intellectual property. In the past few years, he has spoken nationally over 50 times on the commercialization of intellectual property for such bodies as Renaissance Weekend, International Society for Optical Engineering (SPIE), Patent Law Institute, Washington State Patent Law Association, Oregon Patent Law Association, Hawaii State Bar Association, Practising Law Institute and other organizations.